Violence. Narco-trafficking. Illegal Immigration. A place of great insecurity. Listen to the national media and these are the images they would have you believe define and characterize the U.S.-Mexico Border. It’s true, Mexico is confronting serious security challenges and is working hard to tackle them, making progress each day in part with the assistance of the United States. But the benefits derived from scale and magnitude of our economic partnership with Mexico—still one of the best performing and fastest growing economies in the G20 and OECD—literally dwarf those challenges. And that’s a story that’s well worth remembering. 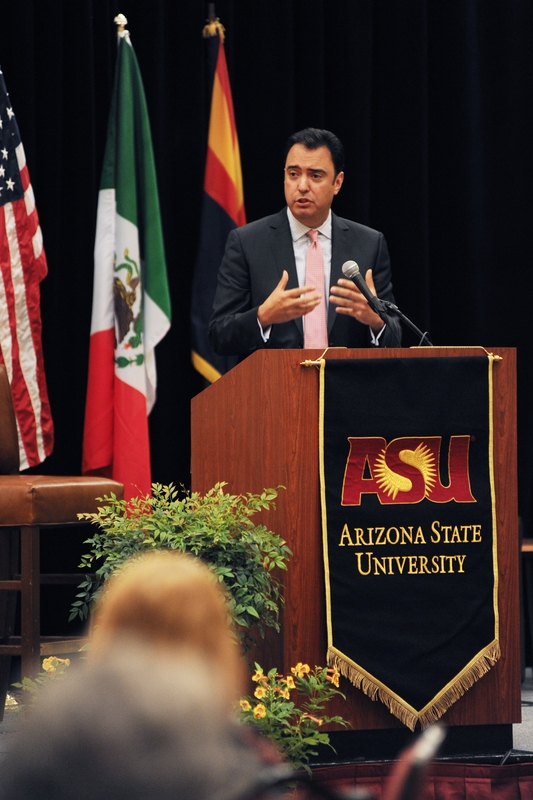 That’s why earlier this week in Tempe, Arizona, I convened and, together with Arizona State University’s Center for Trans-border Studies, co-hosted a bi-national conference focused on the commercial importance of the border region. The conference, entitled “Realizing the Economic Strength of Our 21st Century Border: Trade, Education, and Jobs,” brought together a diverse and distinguished group of leaders from academia, the private and public sector leaders, and members of civil society from throughout the border region. Our goal was two-fold: to identify and share strategies that will promote economic growth and job creation through increased trade; and to raise awareness and build consensus concerning the economic contribution of the border region to the U.S. and Mexican economies. In short, the conference was about changing the narrative about the U.S.-Mexico border by telling the full story about how and why the border region is a key driver of our global competitiveness and shared prosperity. As evidenced in a recent Arizona Republic editorial highlighting the conference, our efforts are already paying off. I’ve previously written extensively about how the border region is vital to the U.S.-Mexico commercial relationship, which is one of the most dynamic economic partnerships in the world. In 2011, two way trade in goods and services between the U.S. and Mexico exceeded a staggering half trillion dollars. U.S. exports to Mexico totaled close to $200 billion, exceeding our exports to Brazil, Russia, India and China combined! According to the U.S. Chamber of Commerce, approximately 6 million U.S. jobs depend on trade with our southern neighbor. Six million jobs! And what happens on the border doesn’t solely affect border towns and border states. More than 20 U.S. states count Mexico as their first or second largest export market, and 28 states did more than $1 billion in trade with Mexico in 2011. Manufacturers in Michigan, Indiana, Ohio, Illinois and throughout America depend on integrated U.S.-Mexico supply chains to bring components, supplies and finished goods back and forth across the border every day, sustaining millions of jobs in factories around the country. And this doesn’t even get to the nearly 13.5 million Mexican tourists who traveled to the U.S. in 2011 and spent $9.2 billion supporting the U.S. economy. Given the importance of this powerful relationship, the Obama Administration launched the Border Export Strategy to highlight the significance of the U.S.-Mexico trade relationship and, more specifically, the vibrant, diverse, and talented communities that make up the border region. This week’s conference, which was attended by more than 250 leaders from both countries, is a key element of that strategy, which in turn supports the President’s National Export Initiative, the aim of which is to double U.S. exports by the end of 2014. The conference also advanced the 2010 joint declaration by Presidents Obama and Calderon on 21st Century Border Management, which is designed to enhance economic competitiveness while augmenting our nation’s security and public safety by supporting a bilateral border master plan process for infrastructure projects in order to increase capacity; expand trusted traveler and shipper programs; and explore opportunities for pre-clearance, pre-inspection, and pre-screening processes for commercial goods and travelers. The conference agenda was packed with substantive discussions and industry-focused breakout panels; it also included important fora where U.S. and Mexican border mayors, members of congress, governors and industry leaders came together to talk about how the border economy is driving growth throughout the region. As co-host, I delivered a keynote address and helped facilitate a discussion concerning the Obama Administration’s 21st Century Border Management Initiative with counterparts from Mexico, Customs and Border Patrol, and the State Department. We also had a chance to hear from representatives of Mexican President-Elect Peña-Nieto, who shared the incoming administration’s vision for the region. My primary message at the conference was to convey that President Obama and his administration understand the value of border trade and the contributions that border communities make each and every day to our national wellbeing. I also emphasized that the United States and Mexico, together with Canada to the north, comprise one of the most competitive regional platforms in the world. With our open borders, low tariffs, strong protections for intellectual property, low energy costs, integrated supply chains, and, most importantly, our skilled work force, our nations are working cooperatively to bring jobs back from remote shores, which is one reason why, for the first time in a decade, U.S. manufacturing job growth is again on the rise. The border truly is a source of strength for both countries, and it is a region that merits investment, support and serious attention from Washington. I’m proud that the Obama Administration is telling that story.